Question: How do you use direct action that really engages and aids the local community in making a stand against Heathrow’s proposed third runway? Answer: Occupy a site set to be demolished for the runway with the intention of returning it to its former glory as a local landmark. That’s what a group of activists, page drawn from Plane Stupid, shop Climate Camp and Climate Rush, have done in the village of Sipson, which lies directly in the path of the proposed runway and would be swept away – along with hundreds of homes – unless the plan to build it is scrapped. And on Saturday, I headed over to the site to see how they were getting on. It was a sunny and, perhaps forgivingly, warmer day than it’s been recently. In fact, one of the Transition Heathrow activists, Lily Kember, informed me the weather hadn’t been bad all week, which must have helped the cause. 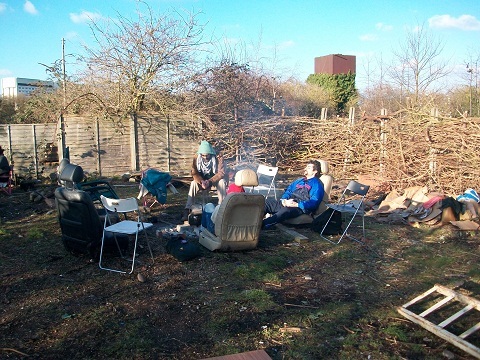 The idea is to transform the 50m X 50m land into the market garden it was for decades before the arrival of Heathrow when it fell into disrepair and, recently, became an eyesore used for dumping car scrap. 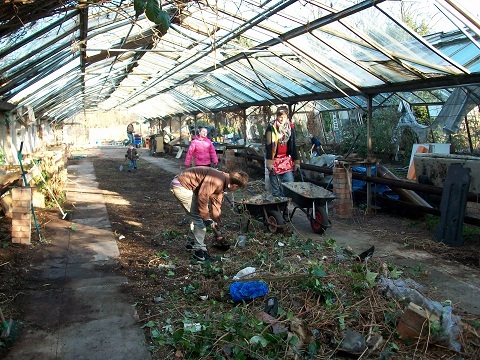 Three greenhouses, each about 35m long, still stand on the site, which the activists and locals want to make full use of, as well as a wooden shed. So, unquestionably, the site is promising, even if the work has only just begun. 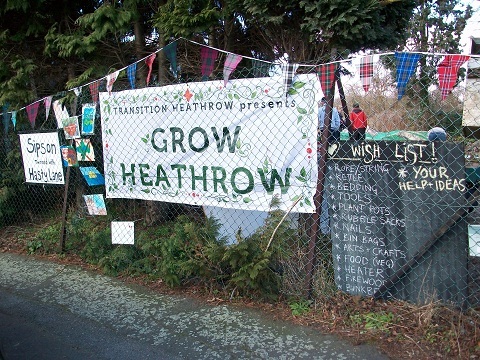 And the project, officially entitled ‘Grow Heathrow’, is part of a wider initiative that the activists would like to see fruition in the shape of establishing a transition town in the area. But first things first, the task right now is to ensure fruit and veg see fruition as the market garden is re-established. Indeed, in my time onsite, there was a definite ‘whistle while you work’ atmosphere, with renditions of anti-Heathrow and anti-Gordon Brown chants, as well as less political sing-a-longs; far more an everybody-muck-in atmosphere than that of a tense demo. 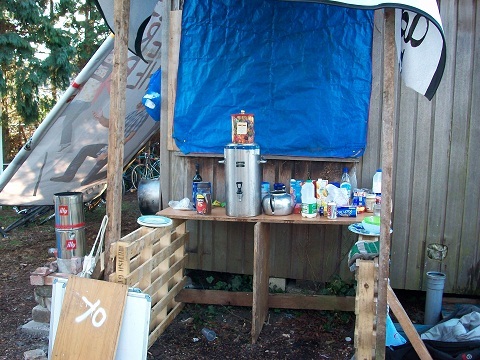 The activists smartly sought to get the locals involved right from the start and it’s clearly working. “I think they’ve got the full support of the whole village,” said Alan Boyd, who lives in the neighbouring village of Harlington and is on the area’s residence association, and had come along to help clear the site. According to another local who’s come along to help today, fellow residence association member Linda McCutcheon from Sipson, the site used to contain some of the best soil in Europe and was prime agricultural growing land up until the end of the Second World War. The current landowner bought it without realising it was land designated for the proposed runway, explaining why it hasn’t been developed on and used as a dump instead. As part of the project the activists are talking to the landowner and trying to come to an agreement over its future. “We’re doing this in conjunction with Greenpeace’s Airplot initiative, which is up the road from here,” said another activist, Barry Wilson. “I’ve been involved in things like this before, but this is the result of different projects coming together – it’s a real concerted effort and part of a bigger picture in terms of preventing the third runway. “It’s not just about community resilience though, it’s also about sustainability. If you can grow your own food supply you can become independent. At the bottom of the site there’s a wild area where someone has cheekily decided to put their horses, so we can use the manure from there when we need to. And on the evidence of my short time spent on the site, I’d definitely agree with Barry. Opposition against Heathrow’s extension plan is obviously very strong in this area – there’s certainly radicalism in the air among the locals. Generally, Middle England doesn’t go in for radicalism, but like a wild animal, if you poke it enough eventually it will retaliate, and this venture looks like a wonderful mixture of locals and activists pulling together for a goal that will benefit the community in more ways than one. You can only but wish them the success.